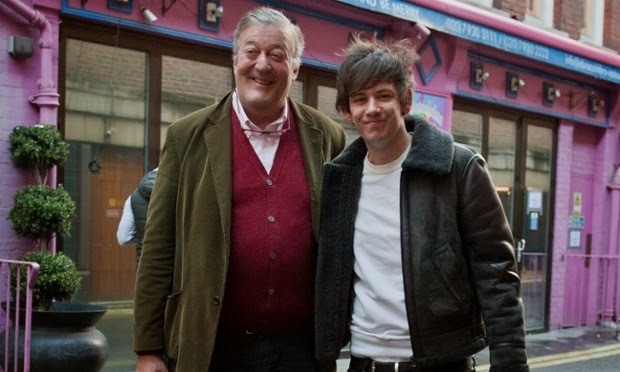 Congratulations to Stephen Fry, 57, who announced his engagement to Elliott Spencer, 27, earlier today. Looks a bit old to me, but whatever makes you happy, Stephen. PS Won't last etc etc. Update: Everything you need to know about the future Mrs Mr Stephen Fry, Elliott Spencer! The Independent. Actually just some things he's said on Twitter. Wait, there's also some drivel by Smugtwit! Hurrah for the gay normals, writes Patrick. And finally... Media obsesses over age difference between Stephen Fry and new fiance, The Advocate. Glad someone did this cause I've lost interest. You're not reporting on the important world of gay world stuff, Figbum!! !